I have a bit of an Expedit addiction. They are honestly the perfect size storage for just about everything and we may have a few too many in our house. Like on in the living room, two in the girls room, two in my office, and two in the playroom. What? So my issue is that I love the fabric bins that Ikea sells to go with them, but they are pretty limited on color choices. Right now you can get black, white, green, and dark pink. But choices like that have never stopped Beth. She went right ahead and painted her bins the color that she wanted them and she will show you how to paint your fabric bins too. 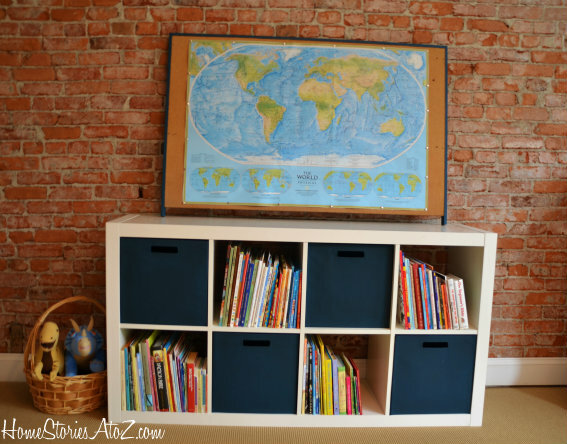 You can check out her Ikea Expedit makeover on Home Stories A to Z.